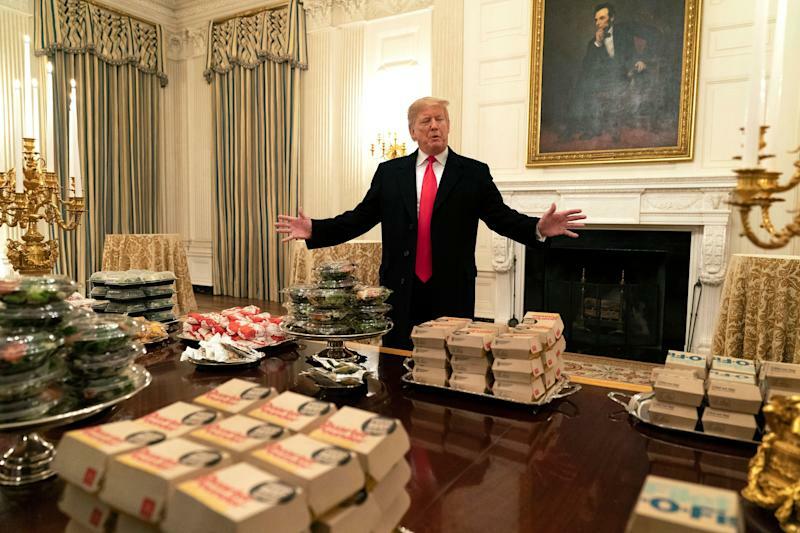 When President Donald Trump decided to treat the visiting college football national champion Clemson Tigers to a smorgasbord of fast food at the White House, he stood in front of a table of plenty. “We have pizzas, we have 300 hamburgers, many, many french fries, all of our favorite foods,” he told reporters in the room, lamenting the partial government shutdown. And while that spread of “great American food” may or may not have been a win for the football players in attendance, it certainly was for the companies whose branding sat in front of cameras capturing the president’s greeting. According to marketing analytics firm Apex Marketing Group, McDonald’s, Burger King, Wendy’s and Domino’s scored what amounts to the equivalent of a combined $15.5 million in free advertising impressions by the stunt. That was driven in part by news coverage that mostly focused on McDonald’s contributions to the table, including Big Mac’s housed in their iconic cardboard boxes. Not to be outdone, however, fast food rival Burger King capitalized on a typo in a tweet from Trump referencing the dinner. 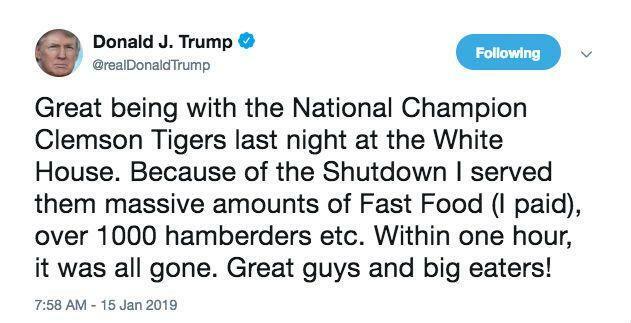 In a now deleted tweet from President Trump's account on January 15, the president mentioned he ordered 1000 "hamberders." “Because of the Shutdown I served them massive amounts amounts of Fast Food (I paid), over 1000 hamberders etc.” Trump wrote Tuesday in a now-corrected tweet. In response, Burger King quipped on Twitter Wednesday that “due to a large order placed yesterday, we're all out of hamberders. just serving hamburgers today.” The tweet racked up over 365,000 likes and helped Burger King cement itself as the big winner from the dinner, at least in impressions coming from Twitter’s platform. “Burger King came in as the biggest winner on Twitter because of the ‘hamberders’ tweet and subsequent media exposure surrounding that,” Smallwood said. The more than $15.5 million earned by the brands in free impressions stemming from the dinner reflect mentions through Wednesday morning across television, radio, digital and social media coverage, according to Smallwood. That number could grow, especially if the scene is lampooned throughout the week. “I mean this isn’t over. If [Saturday Night Live] jumps on it, hold on,” he said, adding that brands featured in SNL scenes tend to enjoy a double boost. Last week, Fiji Water saw a similar win when one of the models the company hired went viral at the Golden Globes for photobombing celebrities on the red carpet. The stunt earned the water company coverage that would have amounted to over $12 million in equivalent traditional advertising spend.